Winchester Bloggers were honoured to be guests at the Winchester Distillery Cocktail Awards evening which was hosted at the fabulous Forte Kitchen in Winchester. Kelly West reports. Prior to receiving the invite from the lovely Belinda of Winchester Distilleries, James and I had little to no knowledge of the event or the Distillery - other than having sampled some of their gins at various venues across Winchester! We’d had also (shamefully) never been to Forte Kitchen, so were looking forward to a Monday night of firsts - and gin. Before we’d arrived, we were already impressed with the venue. From street level, the big windows and distinctive hung lighting meant that Forte Kitchen was an attractive beacon in the early evening sky. It was a fitting continuation of a day that had seen the sun turn desert red thanks to the hurricane-driven sand cloud as well as being a welcoming sight. We were greeted at Forte Kitchen by Naomi who along with her partner Ollie have done a sterling job transforming a tired tea rooms into a show-stopping venue. Naomi and her team made sure we were all served a welcome gin and tonic made up of the signature Winchester Distillery Twisted Nose gin made with locally grown watercress on arrival and kept us fed with some stunning canapés. It was an impressive introduction which has propelled Forte Kitchen to the head of our “must visit next” list of Winchester venues. Having said hello to a number of Winchester Bloggers favourites (Windependents, Gary from Cabinet Rooms and Muddy Stilettoes) it was onto the awards themselves. Winchester Distillery is a local business, based in Alresford specialising in high quality gins. Its brands, such as Twisted Nose and Gunpowder Gin are already massively popular and with the public’s appetite for fine and unique gins showing no signs of abating, the Distillery is growing in stature on a daily basis. Winchester Distilleries Founder Paul Bowler explained the format of the evening. The finest local and regional cocktail makers had been invited to showcase their finest drinks - all featuring Winchester Distillery drinks of course. There were two categories, gin and tonic, and cocktails, and the best news from the audience perspective was that we were allowed to sample them all. We were then treated to a range of talented, entertaining and passionate cocktail makers. Each had a story to tell about how they created the drink we were watching them make. The attention to detail and amount of effort they put into creating the flavour combinations was impressive, as was the number of attempts it took to achieve the perfect drink. The result was a stunning range of inventive drinks which showed the versatility and potential of the gins on display. Chris Palmer from the Langstone won the gin and tonic category. His G&T was based on the Twisted Nose gin, and Chris complimented its watercress flavour with grapefruit juice and grapefruit bitter with also included coriander seeds and juniper. He finished the drink by running fresh coriander around the glass to balance the flavours, creating a refreshing and flavour-packed drink. The winner of the cocktail award was Spike Vandermere with his drink entitled Rose of No Man’s Land. Spike used both fresh raspberry and raspberry vinegar to compliment his Gunpowder gin, explaining that raspberry is in the same botanical family as the rose. 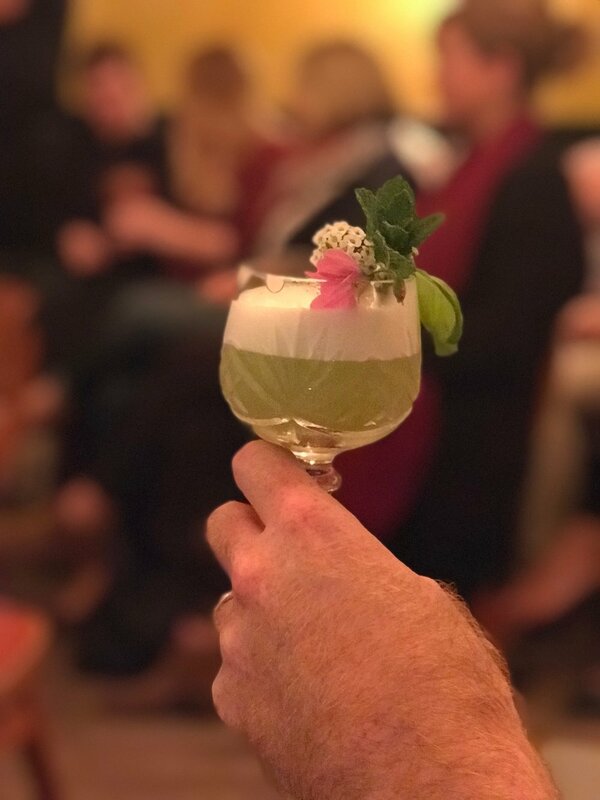 This unique looking drink delivered a pleasing and original flavour which intrigued all who tasted it and impressed the judges sufficiently to secure the top prize. The winners were then announced as brand ambassadors for the Distillery. Yet the effort of all the drink makers who attended will also be rewarded, as the Distillery has pledged to visit each venue, video it being made and promote it though online channels. Overall, we had a great night. We are now on a mission to visit Hattingley Valley vineyard the Winchester Distillery and The Globe (one of the contenders), in just one day, so look out for the report in a few weeks. We promise to take notes - we just hope the notebook makes it home with us. Thanks to Belinda and Paul of Winchester Distillery and Forte Kitchen for having us. If you'd like to find out more about Winchester Distillery and the amazing gins that they produce, head over to their website or follow them on Instagram, Facebook or Twitter.